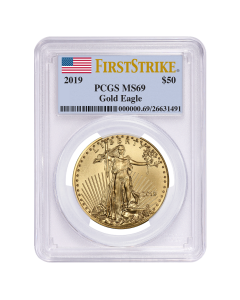 Judged to be absolutely perfect specimens of 2017 1/2 oz American Gold Eagle Coins, these coins are assigned a grade of MS-70 or Mint State 70, the highest possible grade, by PCGS. Moreover, a label of ‘First Strike’ indicates that this coin was a part of the first lot of coins struck by the United States Mint in 2017. Each of these coins contains ½ troy ounces of pure 22-karat (0.9167) Gold. Encapsulated by PCGS in a sealed plastic slab, they are protected from external harm and tampering, ensuring they reach you in perfect condition. PCGS is responsible for the grading and inspection of over 33 million coins since it was established in 1985. They assign grades 60 through 70 for BU (Brilliant Uncirculated) condition coins. MS-70 signifies a coin specimen so perfect that it is impossible to find flaws in it, even under magnification. Understandably, these perfect coins are limited in number and hence hold higher premiums over the spot price of gold compared to other lesser perfect specimens of this coin. However, collectors and investors who cannot bear even microscopic imperfections on their precious metals possessions will enjoy these perfect American Gold Eagles. The obverse of these coins features the famous walking Lady Liberty design by Saint-Gaudens, used on American coinage from 1907 to 1933 – commissioned by President Roosevelt. Showcasing iconic American designs, minted with fine 22-karat Gold and possessing absolutely no flaws whatsoever, these MS-70 2017 half ounce American Gold Eagles will make a healthy addition to any investment portfolio or coin collection – enriching them.